By a 62-point margin, independents said Democrats were more supportive of immigrants coming into the country than the GOP. But those voters are split, 35% vs. 34%, on whom they trust more to handle immigration issues. Immigration policy has been the subject of fierce debate for much of the 21st century in American politics, and the topic is now the most defining characteristic of America’s two major political parties. That’s a main takeaway from a first-of-its-kind Morning Consult poll of independents. Independent voters clearly associate positions on immigration policy with Democrats and Republicans, more so than any other topic. In the survey, which was conducted mid-July among 936 registered independent voters, respondents were given a list of 14 attributes and asked to choose whether they associated those qualities more with the Republican Party or the Democratic Party. 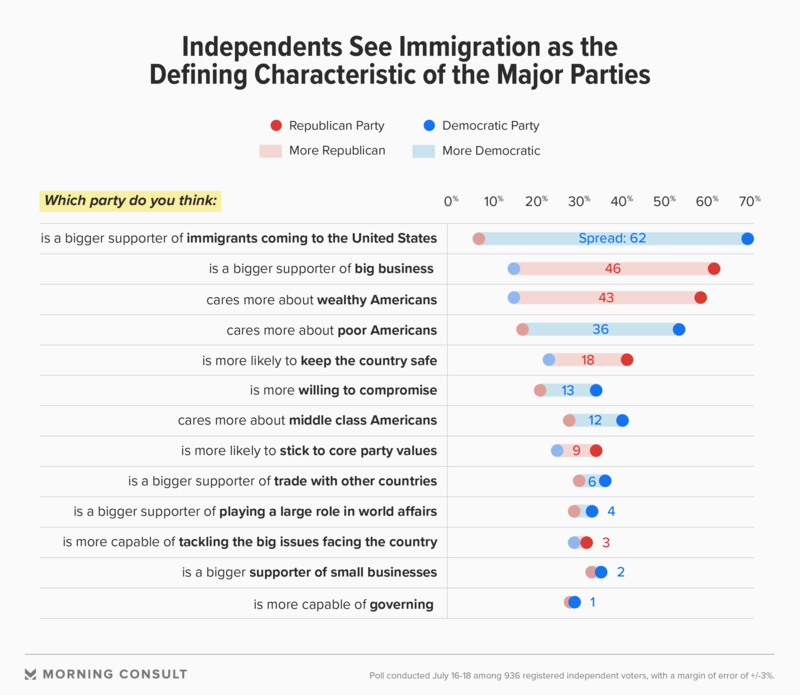 On the question of which party “is a bigger supporter of immigrants coming to the United States,” 69 percent of independents chose the Democratic Party, compared with 7 percent who chose the GOP. That spread of 62 points was 16 points wider than responses to the question of which party was a bigger supporter of big business and 19 points wider on the question of who cares more about wealthy Americans. While immigration appears to be the defining issue for both parties from independents’ perspective, polling also shows that neither side has a definitive upper hand on the issue ahead of the 2018 midterm elections. Independents polled in the survey were closely split over whom they trust more to handle immigration: 35 percent said they backed congressional Democrats, 34 percent opted for Republicans on Capitol Hill and 31 percent were unsure or had no opinion. During his victorious 2016 presidential campaign, President Donald Trump leaned heavily into anti-immigrant rhetoric, from referring to some Mexicans as rapists and calling for a ban on Muslims coming into the country to accusing a U.S. judge of Mexican heritage of being unable to rule fairly. And though that rhetoric ended up being part of a winning message, public sentiment on the topic — largely driven by independents — has since moved toward Democrats as the midterms approach. Related: Democrats Have an Edge With Independents. Will It Grow? In March 2017, Republicans held a 17-point edge, 43 percent versus 26 percent, among independents, while in the survey of independents, Democrats hold a 1-point lead on the issue, within the poll’s margin of error. That shift also comes as opinions toward immigrants have generally softened: Half of independents in the newest Morning Consult/Politico survey said immigrants in the United States today strengthen our country because of their hard work and talents, up 9 points from a February 2017 survey. And the share of independents who said immigrants in the United States are a burden on the country because they take housing, health care and jobs from Americans declined by 16 points during that time frame, from 43 percent to 27 percent. Despite those shifts, the campaign messages from both parties have suggested it’s Republicans who are more confident about winning over the electorate with their stance on immigration. This is particularly true in the case of border security, and the survey suggests why the GOP may be focusing on that message. For the independent voters who said security was their most important voting issue, 52 percent singled out border security as most important, compared with 33 percent who said terrorism and 12 percent who said foreign policy. And on national security issues, independents heavily favor Republicans over Democrats, 45 percent to 22 percent. Just last week, the Congressional Leadership Fund, a super PAC aligned with House GOP leadership, released an ad painting Amy McGrath, the Democratic challenger to GOP Rep. Andy Barr in Kentucky’s 6th Congressional District, as a supporter of “open borders” who “will make it easier for drugs and criminals to flow into our country.” It’s reminiscent of a strategy employed in special elections this year in Pennsylvania, Arizona and Ohio, which brought mixed results for the GOP. Meanwhile, Democrats have, for the most part, focused on health care and the economy in their pitches to voters. Frank Sharry, executive director for the pro-immigration reform group America’s Voice, said in a Tuesday phone interview that the GOP’s messaging strategy was designed to help turn out the conservative base, but that it could backfire with certain types of voters. “Persuasion is a big part, and there are a whole lot of suburban voters who are offended that Trump has divided the country along racial lines,” he said, adding that you don’t see a lot of Democrats leaning into the issue because it’s already heavily covered by the media. For Democratic candidates his group is working with, his advice is to focus on the core issues such as health care and the economy that matter to voters.